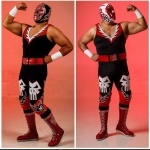 In 1999 Los Hermanos Difuntos were brought in as backup in a rudo trio with Herodes in Monterrey; they were known as The Killer Machine. Since then they have been regulars on the Monterrey scene. He had been in Mexico City/State area in venues like Arena Coliseo Coacalco, Arena Lopez Mateos, and Arena Naucalpan. Moreover, he also has wrestled in cities of the United States. 17/10/01 mask (2) Difunto I Karonte Arena Jose Sulaiman - Monterrey, N.L. 18/02/28 mask Difunto I Angel Dorado Jr. Arena Coliseo - Monterrey, N.L. This page was last edited on 21 March 2019, at 10:48.